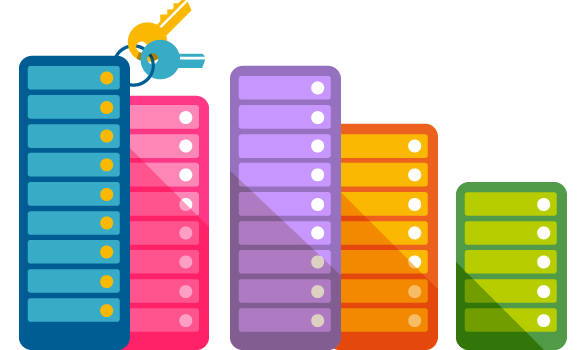 A SuperHosting.BG dedicated server gives you full access to a physical server over which you are granted complete, exclusive control and where you can also host different applications. The applications use the server’s whole hardware resource; no more sharing with other users. Adequate hardware maintenance and quick response time if there's a hardware issue. The dedicated server service is a suitable solution for hosting of high-traffic websites, business management information systems (ERP, CRM, and warehouse management software), large databases and files, ecommerce websites, and much more. Appropriate solution for web projects that require resources grater than those offered in shared hosting and virtual Sevrers plans. The DDoS attacks protection system is an integrated protection at a network level for the hosting services. It retains the normal operation of the websites, by neutralising DDoS attacks to our equipment. The protection system covers 95% of the DDoS attacks known worldwide. 24/7 monitoring of our infrastructure and internet conectivity. Appropriate solution for emplacement of websites with large databases and a lot of files, which have a lot of visitors. Appropriate solution for websites with a lot of visitors, as well as emplacement of large databases and files, that are typical for online shops or online media. Appropriate solution for projects that count on powerful configurations - simultaneously operating processor, more RAM, larger disk space etc. Appropriate solution for businesses that operate with a large amount of information and security and fast operation are most essential for them. Unlimited bandwidth of shared channel. This is the maximum capacity that can be reached. Control panel (cPanel) for the service "dedicated server". The price includes an initial installation. Periodic updates installation is performed by the user. The channel is reserved for the server and is not shared with other users. The option to replace HDDs with SSDs for accelerating your server's performance. The dedicated server is more reliable than other hosting solutions for large online projects. This is due to its higher performance. Whether your website generates high traffic every day or receives multiple requests for loading high resolution photos and videos, the dedicated server will quickly and effectively provide your visitors with the content they need. On us, you will get free hardware maintenance of the server and quick response time if there's a hardware issue. When choosing our technical equipment, we trust only proven brands that we have been already using for a whole decade. In this way, we grant you a high-quality service, and the websites that are hosted on our servers are always up due to our reliable and proven hardware capabilities. Our technical equipment is collocated in a specialized data center of Equinix. Our Internet connectivity is being provided by the leading Bulgarian telecommunication companies Evolink AD and Neterra Ltd., which offer and support a wide range of telecommunication services. With a SuperHosting.BG dedicated server, you can count on reliability and high level of performance for data storage and processing. This is due to the parallel execution of I/O processes when using RAID technology. For better server power, you can add the SSD disk array option. The SSD technology ensures faster data processing. Server-hosted websites are loaded faster, which improves user experience and is taken into account when websites are ranked by Google. If your online projects require a more specific configuration, do not hesitate to contact us! In addition to standard offers, we also have other server configurations at exclusive prices, some of which are offered without a time-limited contract. For further information on our attractive offers, feel free to contact our Sales Department.